In Kazakhstan, GDP growth for 2011 is forecast at 7% thanks to high global oil prices. Oil exports are hampered by shortcomings in terms of both transport infrastructure and production capacities. In the biennium 2012-2013 the Kazakh economy will grow by 6%. Both consumer and investment demand will rise, the latter more rapidly. The banking sector has not yet fully recovered from the crisis. As asset cleansing gets underway in the banking sector, the economy will benefit from a gradual improvement in access to funding. 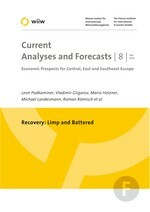 As a result of high global food prices, CPI in 2011 will increase to 8%. In the biennium 2012-2013, inflation will slow down to around 7%.